The Bolinhos de Bacalhau or Pastéis de Bacalhau, literally, “codfish cakes,” are a true national speciality. 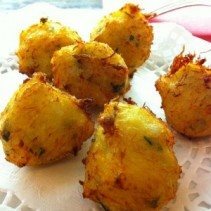 They are deep-fried balls that traditionally contain less expensive parts of the dry salted codfish mixed together with potatoes, eggs and parsley, in the same way as fishcakes. Cod cakes are ideal for snacks (hot or cold) and are present in every Portuguese event or ceremony. Snobs may be afraid of admitting that they too love this “poor-man’s dish,” but they probably eat them all the same, when nobody’s looking. Codfish cakes are sold at delicatessens, patisseries, roadside cafés, taverns called tascas – everywhere in Portugal. Leave the cod to soak at least for 24 hours in a basin with cold water. Do not cover the basin and change the water several times. Before cooking taste a few strands to make sure the cod is not too salty, although it should retain some saltiness. Boil the potatoes in their skins (not to absorb water) and then peel and mash them. Set aside. In the meantime, cook the fish with the bay leaves for about 15 minutes on a low heat. Then, when it’s tender, drain, discard the skin and bones and flake it as much as you can with your fingers. Then with a fork, reduce it to threads. The traditional Portuguese way of doing this is to place the flaked cod inside a clean cloth, fold it and squeeze and pound the contents of the cloth with your fists. In a large bowl, mix the shredded cod with the mashed potatoes and add the eggs one by one, then the onions, garlic and parsley that was previously chopped. Season with salt and pepper. Mix well and knead the mixture with your hands as if it were a dough. The mixture should be quite stiff, enabling a spoon to stand up in it. If it is too crumbly, add another egg. Allow this to cool completely before deep frying. With two tablespoons, shape small portions of the mixture into small cakes and deep-fry them in the hot oil ( 190 C ), turning them three or four times to get nicely browned all over. When cooked, lift them with a big fork or slotted spoon, and place them on kitchen paper to absorb excess fat.